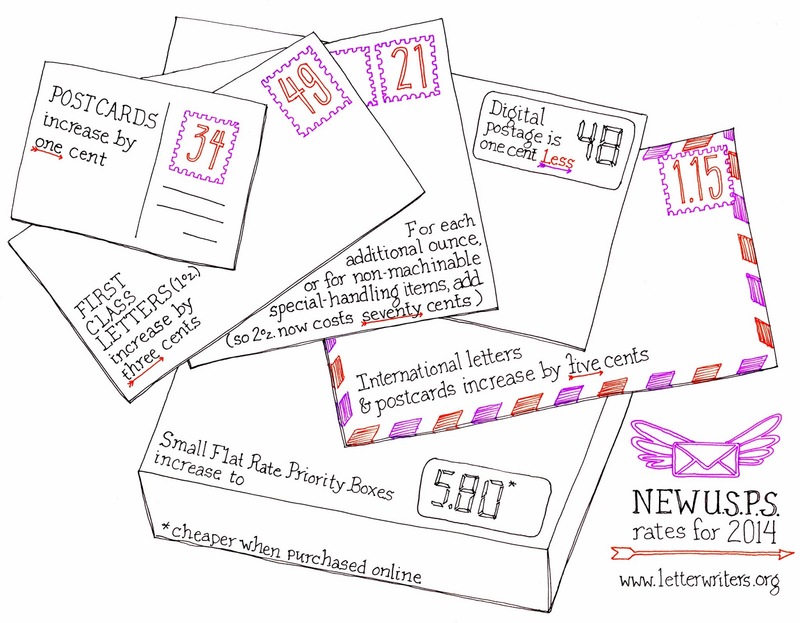 For my USA readers: postage rates changed on January 26, 2014. Yes, I am a month late announcing this news here on Ye Olde Blogge, but I hope this fabulous graphic makes it worth the wait. Thank you to Donovan of the Letter Writers Alliance for sharing this lovely image detailing the new rates, and for making it Creative Commons licensed so we can all share the love; you can see her full post here. *Oddly enough, metered letters are 48 cents instead of 49 cents. But isn't a stamp prettier than that ugly meter label, and worth another penny? I love the graphic! Postage rates have just increased over here in the UK, too (as of the end of March)..